I give thanks to you, all-powerful and eternal God of truth, Father of our Lord Jesus Christ, Creator of heaven and earth, of humanity and all creatures, Sustainer of all things, Giver of all life, order, and wisdom, unfailing Source of help; And to your Son our Lord Jesus Christ, your Word and eternal image; And to your Holy Spirit, with whom you endowed the apostles at Pentecost and have brought to comfort all who confess the name of Jesus the Christ, until his coming again. I give thanks to you, O God of holiness, and truth, and wisdom and goodness, justice and mercy, purity and loving-kindness, for with goodness and wisdom unmatched you revealed yourself to us, sending your Son into the world, humbling Himself to be emptied of His divine form to become truly human, a slave and a servant to us, and a sacrifice for our salvation. I give thanks to you, Mighty God, for gathering your eternal church, for guarding the ministry of your Word, for granting your Holy Spirit, and for the gift of everlasting life. I thank you, O God, because you have given us all good things, because you alleviate the chastisement we justly deserve, because you bestow upon us all the blessings of soul and body we enjoy. To you be all glory, honor, praise, and thanksgiving, forever and ever. 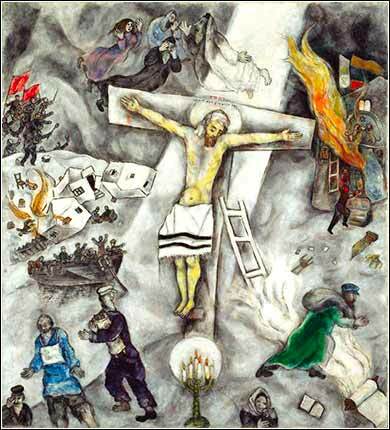 White Crucifixion by Marc Chagall, ca. 1938. But I say, walk by the Spirit, and you will not gratify the desires of the flesh. For the desires of the flesh are against the Spirit, and the desires of the Spirit are against the flesh, for these are opposed to each other, . 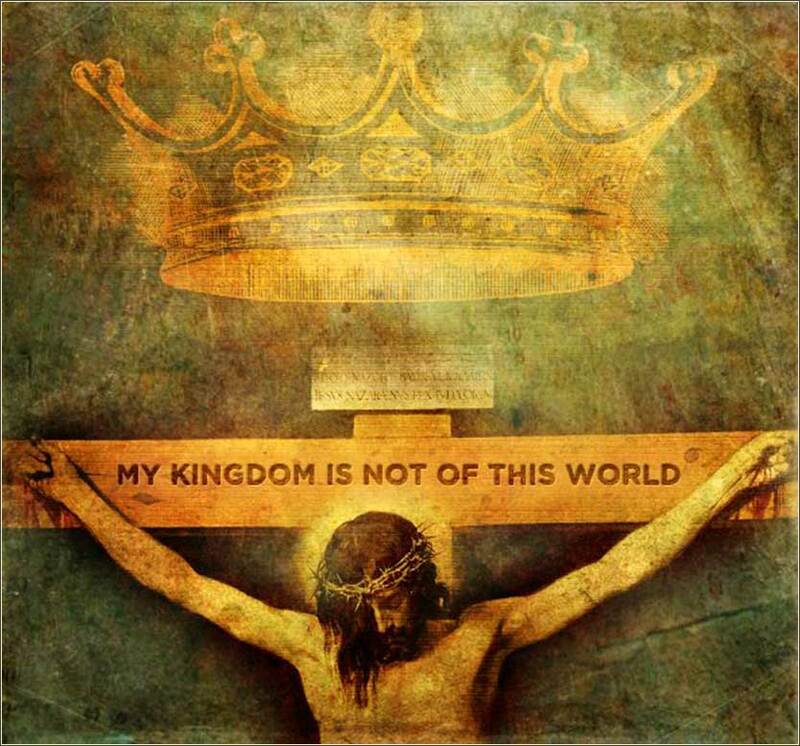 . .
Christ’s Kingdom is not of this world. All of us are sinners, and all of us sin by choosing things of this world over things of God. As Christ put it, we choose in accordance with this world — a world that is under the dominion of Satan — rather than in accordance with the Kingdom of God. As Paul puts it, in his iconic statement of Christianity's moral core, we choose to gratify the desires of the flesh, which are opposed to the desires of the Spirit. or the next few days, we are going to examine the implications of this teaching, as it relates to other verses of the Bible and as it relates to our lives. All of us distort the Bible in order to hide our sin from ourselves. We will use Galatians 5:17, in effect, to pry the lid off our own hypocrisy. The Biblical relationship of the Christian to this world can seem difficult to understand. Yet, like most broad concepts in the Bible, misunderstandings arise not because the Bible itself is unclear, but because we have difficulty listening to God rather than our own thoughts. Where something in the Bible disagrees with our preconceptions, values we learned growing up, or anything that has been firmly implanted, we try to harmonize them. The French have a brilliant expression for such a preconception — “idée fixe” (literally, “fixed idea”), an idea that becomes so deeply rooted in our minds that it cannot be dislodged. The Bible is the very Word of God. We must therefore conform ourselves to it. In reality, however, when something in the Bible bumps up against an idée fixe, rather than change our mind, we try to change the Bible. The process can be as subtle as a translator choosing a word that conforms to his notions, or as radical as intentionally inserting and deleting Bible passages. For most of us, it consists of finding a line of logic that will enable us to think of ourselves as following the Bible, when we are not. Is ISIS (or the Taliban) your enemy? Do you love them and pray for them? Try to stand back and identify the reasons your mind will invent, the “but” sentences, why Christ's teaching does not apply to your actual enemy. The only nation even mentioned, in connection with God's Kingdom, is Israel. Is the modern-day State of Israel the nation of God? Hardly. In fact, Galatians tells us just the opposite. In Galatians 4:21-31, Paul tells us that earthly city of Jerusalem is the capital city of slavery, which must be rejected by anyone who would find freedom in Christ. He actually commands us to “cast out the slave woman and her son,” for they will not inherit the Kingdom of God. The “New Jerusalem” (which Paul calls the “above Jerusalem”) is not located in modern-day Israel. It exists only in the Kingdom of God — which Christs tells us is not of this world.